Introducing the monk policeman – but is his cover blown? Social media was alive with chatter after a busted monk appeared on Facebook. Nothing unusual there but it was not the hapless former holy man in the foreground who had been arrested for drugs that caught the attention of observant netizens. It was the portly figure in saffron robes standing proudly behind the suspect – wearing police ID around his neck. 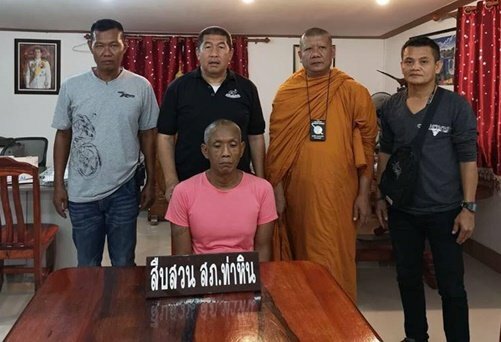 Everyone imagined that the cop had dressed up as a monk to effect the arrest but it turned out that this was not quite the case. Manager discovered that the cop turned monk is really a monk after all. Phra Khru Pichet, 49, has been a monk for 27 years and helps the Lopburi force unearth criminal behavior at temples from time to time. In fact he has been doing it for ten years with locals referring to him as “tamruat phra” (police monk). No one seemed unduly concerned that Phra Pichet’s cover would be blown however. After all, as Thai visa observes, he tends to blend in without eyebrows and hair…..
New “Model policemen” to be launched in Bangkok – better than the flesh and blood variety!